Summer is here and what better way to celebrate the hot, sunny weather than a dip in the swimming pool? In honor of Swim a Lap Day (yes, it’s a real holiday!) 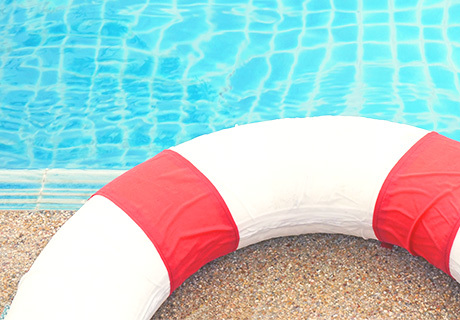 on June 24th, we’re sharing 7 essential pool safety tips that will keep your water-loving family happy and healthy all summer long. There’s no better way to cool off, work out and have fun together than splashing around in the swimming pool—and staying safe! Make sure you’re always actively watching your children when they’re playing in or near the pool. You should be within arm’s reach at all times and be sure at least one person is keeping an eye on the kids. It’s very important that your children, and any child swimming in your pool, knows how to swim. This is not only important when they’re in the pool, but it’s also critical that they know how to swim in case of accidents near the pool that would cause them to fall in. It’s easy to sign your kids up for swimming lessons to ensure their safety near water. In the event that drowning would happen, it is critical that you or anyone else who might be around a pool know how to perform CPR, water safety, and first aid at any given time. Make sure to also have a first aid kit nearby and teach kids how to call 9-1-1 in case anything unexpected happens. Sign up for training at the American Red Cross and learn skills that make a difference in life or death situations. Secure the area around your pool with a regulation sized fence, which is about 4 feet high. Make sure to have locks on every gate and that everything is secure when the pool is not in use. It might also be a good idea to install a safety cover on your pool in case anyone falls in. Finally, be sure to have proper coverings on all drains and suctions and make sure your children are aware of them and do not get too close to any. All pools require maintenance to keep them safe and clean. One key element is making sure your chemicals are balanced; it’s an important step in making your time in the pool a good one. Regularly testing your chemicals and balancing them as necessary helps reduce skin and eye irritations and can prevent rashes, allergic reactions, or even more serious side effects. So make sure your pool chemicals are balanced! A safe pool is a happy pool. It’s important that everyone who swims in your pool is well of important safety rules and emergency contact information. Consider tried-and-true rules such as: “Never run around the pool,” “Always swim with a buddy,” and “No diving.” This will ensure that everyone knows and follows the rules. It can make all the difference.